Our range of products include sandstone bench, stone bench, marble bench and stone sofa. 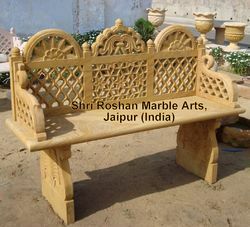 We have come forth as the leading manufacturer, exporter, wholesaler, trader, retailer and supplier of Sandstone Bench. The given sandstone bench is intricately crafted by our innovative craftsmen by making use of best quality stone & it’s shaping tools in compliance with the market trends. Offered sandstone bench can be customized as per the specific needs of customers in a given time frame. 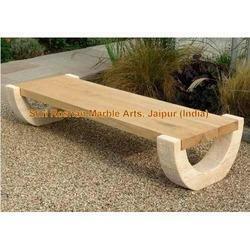 Customers can easily avail this sandstone bench from us at affordable rates. We are one of the prominent manufacturers, exporters and suppliers of some unique and natural looking Stone Bench. A natural product with modern wave design make this stone bench a centre of attraction in your lobby or garden. Our team offer 100% customization of its products (Stone Benches and all) according to size as asked by the customer. Made of stone & hence everlasting. Gives your house/Haveli/Resorts/Hotels a royal look. Natural Product and hence blends in Nature. Just give the size, pay 50% as advance and relax. We will ship these or will be there for fitting As soon as possible. Our company is always on top in creating some lavishing marble artifacts. 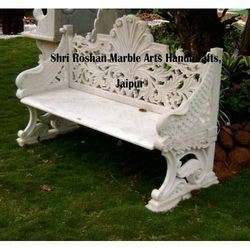 WIth the same art we have bought you Marble Bench, a beautiful piece of art to kept in Garden for siting purpose. Beautiful antique design & finished with a smooth surface, This marble bench have become a symbol of royality or luxury. We are engaged in manufacturing & export of some artistic designed Stone Sofa set or individual Stone Sofa. We are one step ahead of our competetiors in manufacturing of some beautiful carved designs of Stone Sofa. Made with sandstone, this Stone Sofa is ideal to be put inside a room or garden. Looking for Stone Benches ?